I saw that Make Up Academy were having their Winter sale with up to 75% off so I decided that I'd have a look and see what they had on offer. 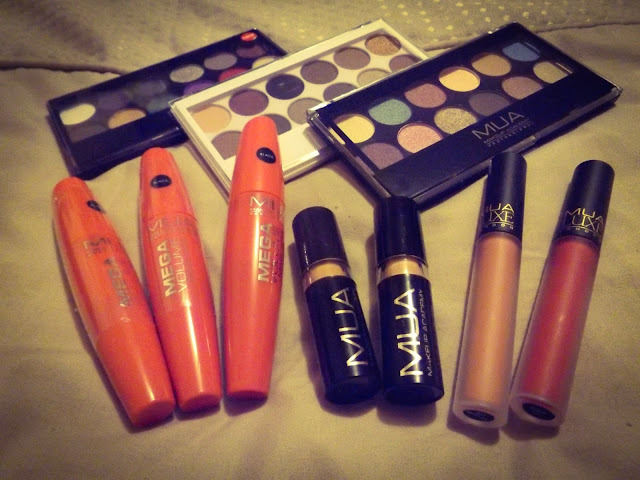 They had some great deals and when I saw some fab eyeshadow palettes on sale I just had to get them. MUA can be purchased exclusively at Superdrug or online at their website http://www.muastore.co.uk/ . I bought 3 eyeshadow palettes (2 of which were on sale), 2 concealers on sale, and 2 of their velvet lip lacquers. The Romantic Efflorescence Palette has some really pretty plum and brown colours in it so I thought it would be perfect to create an every day eye make up look or even a dramatic evening look. The 12 Shade Glamour Nights Palette contains some darker colours like the dark green and the navy, it has a really pigmented white eyeshadow and 2 very bright colours: a bright purple and a kind of crimson colour, both of which are fabulous but not for everyone! The 12 Shade Glamour Days Palette is mostly shimmery light colours and some brown eyeshadows which are always handy for every day use and again there's a bright purple colour in this pallette but it's not as bright as the one in the Glamour Nights Palette. When I received my order I just had to try out the bright purple from the Glamour Nights Palette and the look I came up with can be seen on my instagram account. I bought 2 light concealers which were a bargain at €0.40 each, and when I got them I was actually disappointed that I didn't buy more because they have a great consistency that stays all day rather than fading after a couple of hours. Having bought 3 of their Velvet Lip Lacquers before I decided that I'd buy some more in their other colours and I ordered them in the shades Dare and Tranquility. I had already bought Halcyon, Kooky and Reckless and loved the colours. 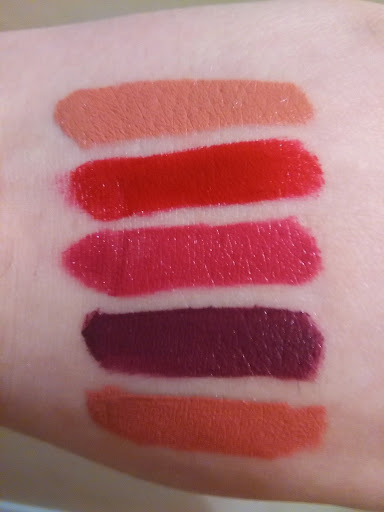 The only annoying thing I'll say about these Lip Lacquers is that after a couple of hours they dry up a lot and can clump into tiny balls on your lips and fall off, but I still think they're great value for €3.97 each. Left to right: Tranquility, Reckless, Dare, Kooky, Halcyon. Top to Bottom: Tranquility, Reckless, Dare, Kooky and Halcyon. If you have any suggestions on posts you'd like to see me doing in future please comment below! You can also follow me on Instagram and Twitter to see what I'm up to until I post my next blog post!